Almond Glow Coconut Skin Lotion - I am not a fan of traditional lotion so this oil seems to do the trick. Seems to work best when freshly damp and just out of the shower. Plus it smells like coconut and absorbs pretty quickly. 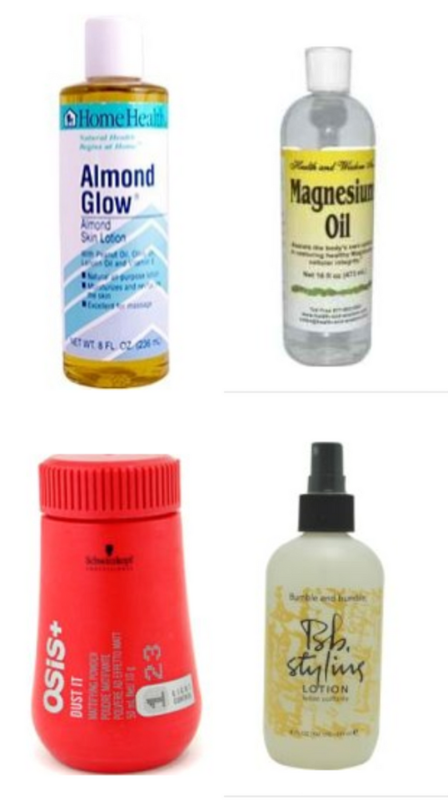 Magnesium Oil - I am in love with the below magnesium oil. I use it for all sorts of things like sore muscles or headaches since it is a natural muscle relaxer. It also can be combined with toothpaste to tighten the gums. For some reason I feel the need to rub it onto the bottom of my freshly cleaned feet. Here are some of the reasons as to why I use it. Osis Dust It - Great volume when applied at roots before blow drying. Bumble & Bumble Styling Lotion - One of my favorite hair styling products at the moment. You are gorgeous so seeing you endorse these products makes me want to run out and buy a few! Especially the dusting powder, interesting..! Thank you for this post! Always looking for great products - definitely going to try a few! Ahhh.... I'm very pro-large windows in the bathroom. Ideally with the fog/steam thing that blurs the windows, just in case. I do love my Bumble & Bumble. I also use Josie Moran's Argon oil on my hair after washing - it's a fabulous product! Great bathroom!Thanks for posting the products!It's really useful! i too, LOVE almond glow, and i love it in almost every scent. i just hate i have to go to whole foods to get it...i never think of it when i need it!